The Shinto shrines of Asama type (or Sengen, by a different reading) are dedicated to Konohanasakuya-hime (or Sakuya-bime), the doughter of Ōyamatsumi, a kami of mountains (yamatsumi means spirit dwelling in mountains). Konohanasakuya-hime is known as the blossom princess and the symbol of delicate earthly life, and at the same time is the goddess of Mount Fuji and all volcanoes. 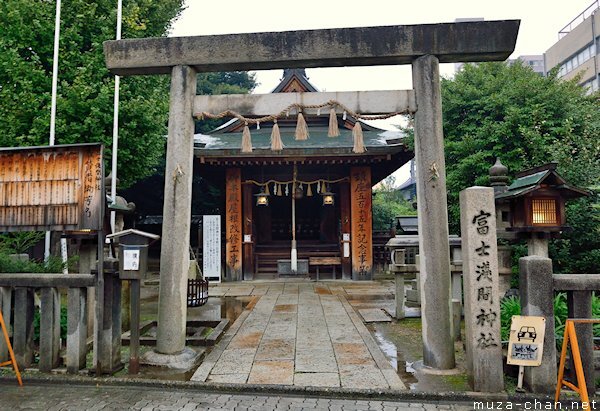 The head shrine is Fujisan Hongū Sengen Taisha, in Fujinomiya, Shizuoka Prefecture, and other such shrines are established throughout Japan, like this 500 years old shrine photographed in Nagoya, next to the Ōsu Kannon shopping district.